One of the laws that we strictly enforce is the “Failure to Stop For a School Bus – Loading or Unloading”. I have gotten asked many times in the past about which traffic has to stop and which traffic doesn’t. I would like to explain this; we have a zero tolerance policy for individuals that violate this law, as do many other agencies. First, on roads with two or four lanes with just a center stripe in the middle, all traffic must stop as shown in image on the left. 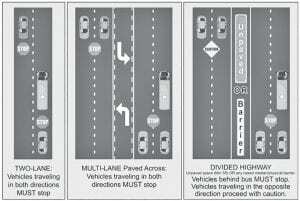 On multi-lane roads with a center turn left-hand turn lane, traffic going in both directions must stop (middle image). 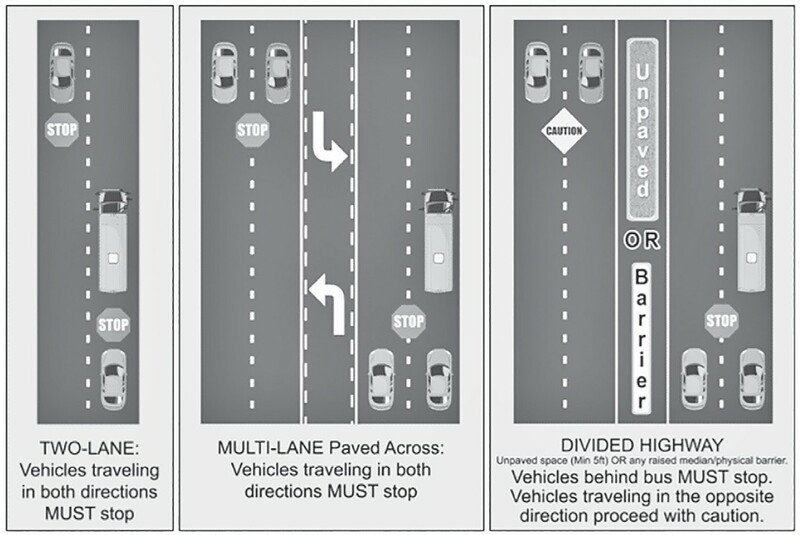 On divided highways with an unpaved or raised median that is five feet in width or more, or a barrier of any kind, only traffic traveling the same direction as the school bus must stop. Vehicles traveling the opposite direction of the school bus are to proceed with caution and should not stop (image on right). Failing to stop for a school bus displaying red alternating flashing lights is a misdemeanor offense that must be filed in the County Court at Law and is referred to often as a “Special Misdemeanor”. The punishment is a fine of not less than $500 nor more than $1,250. This law is covered under Section 545.066 of the Texas Transportation Code. 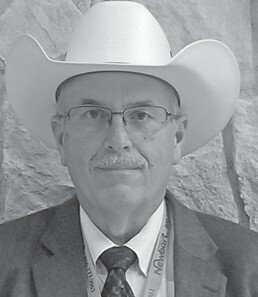 It was the obvious intent of the Texas Legislature to make this a more serious offense than a normal traffic violation. Fines on most traffic offenses are $500 or less and are Class C Misdemeanors. Five hundred dollars is the maximum amount of fine that can be imposed in Justice of the Peace or Municipal Court. Therefore, offenders violating the failing to stop for a school bus are citied and must appear in the County Court at Law at the Courthouse. I hope this clears up any misunderstanding of the law and that you know when you are required to stop. Most important of all, keep our school children safe and our residents out of trouble by following this law. Not only is it the prudent thing to do, It’s the Law. 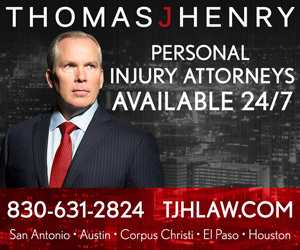 Have a safe week and if we can be of any assistance to you, please call my office at 830-769-3434.